Runs Bigaria-label="A rating of 1 means too small, a rating of 5 means too big, a rating of 3 means true to size. This items average rating is 1.5. The modern Carabinieri has served honorably as the national military police of Italy since 2001, policing both military and civilian populations. While you don't have to keep your cool while detaining an unruly crowd, your mission is to keep your noggin warm in the dead of winter. Pull down the ear flaps on this Insulated Wool Cap and achieve that mission. 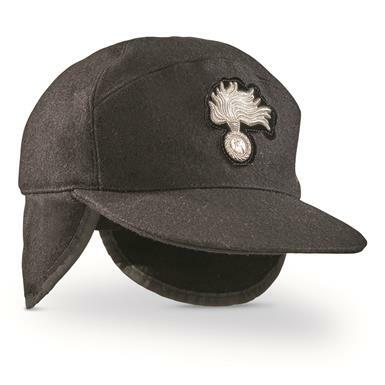 Italian Military Surplus Carabinieri Insulated Wool Cap, New is rated 4.0 out of 5 by 2. Rated 3 out of 5 by Scout Eagle Eye from Nice Hat, crazy size This hat is cool but it has taken some work to be wearable. My head circumference is 22.5'' (which is usually the border between small & medium) but I could not smash a medium onto my head until i pulled the leather sweat band out, and then I stretched the wool by wearing it in the rain. I say ordering 2 sizes up will give you a nice comfortable fit out of the box.Do Italians really have tiny heads? I'm considering ordering a size small for my 4 year old. "Czech" out this great deal! Top lid concealment with earflaps. Five caps to fend off the freeze! Hailed by German troops on alpine maneuvers.